Tag line: "A CHILL-AND-CHUCKLE CHASE!...A FORTUNE AT STAKE AND A MONSTER AT LARGE!" It’s been years since I last watched the 1939 version of The Cat and the Canary, which occasionally played on public television when I was a kid. Part murder mystery and part haunted house story with Bob Hope on-hand to tell a few jokes, it’s a thriller with a good sense of humor, and I was glad I finally got a chance to see it again. The setting is a desolate mansion in the swamps of Louisiana that once belonged to eccentric millionaire Cyrus Norman, who lived there with his housekeeper Miss Lu (Gale Sondergaard) right up to the day he died, exactly 10 years ago. Per Mr. Norman’s instructions, all of his remaining relatives are to gather in the house on the 10th anniversary of his death for the reading of his will. The first to arrive is the family’s attorney, Mr. Crosby (George Zucco), followed closely by distant cousins Susan Tilbury (Elizabeth Patterson), Cicily (Nydia Westman), and Fred Blythe (John Beal). Rounding out the group are Charlie Wilder (Douglass Montgomery); magazine illustrator Joyce Norman (Paulette Goddard); and radio personality Wally Campbell (Bob Hope), all of whom are anxious to hear what old uncle Cyrus has left them. When the will is read, they learn that Joyce is the sole heir, but there’s a stipulation: should she prove to be insane (a condition that runs in the family) or die within a month, then the relative whose name appears in a second, sealed envelope will inherit the whole shebang. Naturally, this puts everybody on edge, including Joyce, who realizes that the person next in line might try to bump her off in the night. To make matters worse, a security guard (John Wray) shows up to inform them that a homicidal maniac has escaped from the nearby mental institution. Known as “The Cat”, this killer has long fingernails and likes to crawl around on all fours. Spending the night in a spooky mansion with a psychopath on the loose isn’t anyone’s idea of a good time, but fortunately Joyce has Cousin Wally to protect her. The question is: who’s gonna protect Wally? With its clever use of shadows, coupled with a creepy performance by Gale Sondergaard as Miss Lu (who seems to be in touch with the spirits residing in the house), The Cat and the Canary can, at times, get the hairs on the back of your neck to stand straight up. The tension is further heightened by the sudden appearance of “the Cat”, who makes his way through secret passageways, popping up every now and again to torment Joyce. At one point, “The Cat” even helps fulfill a prophecy of Miss Lu’s, who said that someone was going to be killed before the night was out. It’s all very sinister, but luckily we have Bob Hope to lighten the mood. Tossing out one-liners every chance he gets (when Cicily asks him if he’s afraid of empty houses, Hope’s Wally replies “Not me. I used to be in vaudeville”), Hope keeps us giggling when everyone else is too scared to talk. 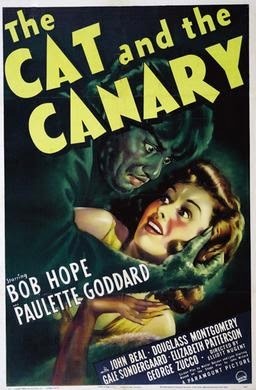 Boasting an equal share of laughs and frights, 1939’s The Cat and the Canary is that rare horror / comedy that delivers on both counts.